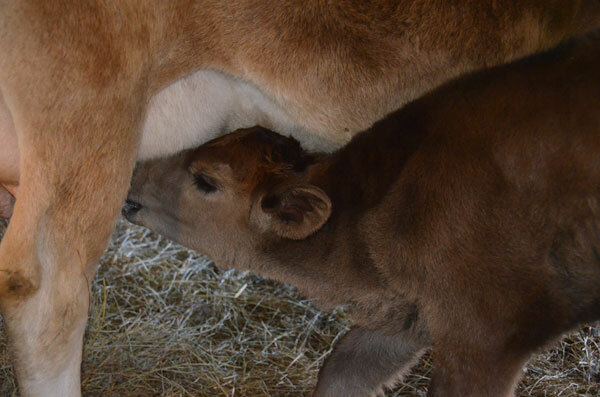 I’ve been spending a lot of time with the Jersey cow and her preemie calf. When viewed from the side, Rosie looks pretty good. At this angle, she still looks very pregnant. Or very fat. Whatever you call it, she’s still huge. I worried about bloat. I dreamed one night that by some freak chance she had another calf in there, still growing and biding its time until it could emerge like some alien space creature with big teeth and a raging, carnivore appetite. I’ve never wanted a bottle calf. In my experience, four-legged bottle babies are pushy, demanding pests. A few years ago I got a scary-looking hickey from a bottle calf that thought my thumb made a good pacifier. I’ve been bumped, shoved, and slobbered silly by half-grown calves that think humans are just part of the herd. And then along came Cocoa. On sunny days . . .